Well, it's getting close to that time of year again -- the time when we all start to figure out what holiday gifts we want to give to friends, relatives, neighbors, teachers. I hate waiting until mid-December to think about this because then I end up lunging for overpriced items that I could easily make myself if I weren't in panic mode. So . . . Christmas in October. It works for me. This cheese ball made with sun-dried tomatoes (or in my case, dehydrator-dried tomatoes; see tomato glut here) is super simple to put together if you have a food processor. Just four ingredients, whirled together, then shaped in a ball and rolled in toasted chopped nuts. Takes just minutes. And for those who don't like to cook -- there's no cooking involved. This recipe makes a lot -- three good sized cheese balls, or six 1/2-cup balls for small gifts. Feel free to divide it by three when you're first trying the recipe to see if you like it. No sense in having all those cheese balls lying around. The recipe comes from this book, Christmas with Southern Living 1993, which contains Christmas decorating ideas, crafts, and recipes. For a while I was on quite a roll, buying Christmas crafts and recipe books year after year. I'm thinking at this point I probably have enough. But they are awfully fun, and full of inspiring pictures, even if all you have time to do is admire the inspiring pictures. Use knife blade in food processor bowl. Add first four ingredients and let the machine chop away. When tomatoes look to be pretty well diced (probably only 20 seconds or so), scrape the mixture into a bowl and refrigerate. (The recipe says to chill for three hours or more, but being the impatient cook that I am, I usually just proceed without chilling. It's a little sticky, but it still works.) Shape into three one-cup balls, or six 1/2-cup balls. Roll in the toasted nuts. Wrap each ball in plastic wrap and refrigerate. Serve with crackers. NOTE: My food processor is really a mini-chopper, so if I'm making the whole recipe, it works best for me to do it in three batches. I've never tried it in a blender, but that might work, too. I'd love to hear what food items you make for gifts. If you've posted about some of your favorites, feel free to leave a link in your comment. My stomach and I thank you in advance. ANOTHER NOTE: For more ideas from Works-for-me-Wednesday, go here. I'm so glad you posted this. I was just thinking of making a zillion pumpkin breads, but what with the pumpkin shortage, I thought I'd save my meager cans for myself. Anyhoo....cheese balls were a staple of my holidays as a child. My mom would make a Christmas-tree shaped one every year for our Christmas Eve parties. I think it may be time for me to take over that little tradition. Carpool Queen, a cheese ball in the shape of a Christmas tree sounds adorable. If you or your mom make any this year, will you take a picture of it and post it? Puh-leeeeeeze? mmm, i love cheese balls, perfect for a gift! The cheese ball looks delicious...can almost taste it with crackers. 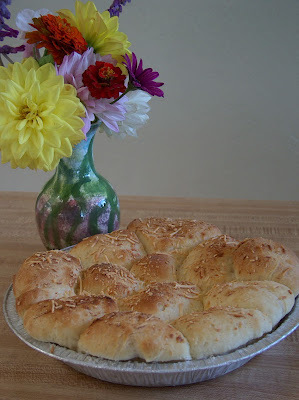 I love homemade food gifts (both giving and receiving them!). I especially like giving homemade candy...two of my favorites are homemade truffles and English toffee. Neither of my recipes are posted on my blog yet, but I'm planning to make and post them in a couple weeks! And your cheese ball looks really delicious! I have never made my marinated sun-dried tomatoes at home. It seems interesting! Since you used home dried tomatoes instead of the bottled ones, can you tell us how much you used? Did you soak them in a little olive oil first? This looks really yummy! http://theprudenthomemaker.com/FrugalGifts.aspx There's also a link on that page to my Sewing for Less page, which has lots of sewn gifts. Hi, Lynn. Have you ever made those cookie mix-in-a-jar gifts? Just wondering if you have any recipes that look good and make good cookies. Thanks! This year I'm really going to go the homemade route and am sincerely hoping someone gifts me with a tray of homemade cookies which I do not enjoy making myself. can you freeze them, if you make them early? can you just find the sun-dried tomatoes at the store, or i guess i could try to make them? OH YUM! I really shouldn't spend time drooling over your blog right before I head to bed... it's not good for my metabolism! But such great stuff. I noticed that you live in No Cal... We lived near Chico/Redding for many years and just went back for a visit. SO MUCH FUN! I have had fun perusing your blog! I have never made cheese balls before, but after seeing how easy it is, I will have to give it a try. I would never think to give anyone a cheeseball. But I love them and never buy them for myself cause they are overpriced...so I guess it is a great idea. 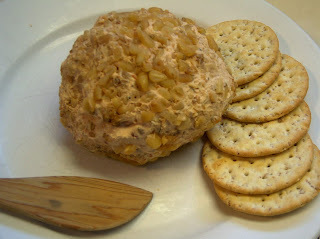 I love a good cheeseball recipe- I'll be trying this one. This is so cool! I've been trying to find your book with no luck and here you are with a blog! GREAT! I love homemade gifts, so this recipe is a keeper, thanks! I'll be back for more! Hi Lynn. Thank you so much for the comment. It made my day! I'm glad you liked the scones. When I was sick last week I didn't have much appetite for anything except those scones. My husband only got to eat one of them and I ate the rest...all of them in about two days:) Oh well, at least they are pretty healthy. And absolutely, feel free to post a link. Sue@Country Pleasures, thanks for coming by. 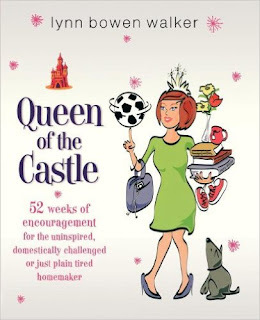 I'm glad you found my blog :) As for finding my book, Queen of the Castle, see if your library has it; if they don't, they might be willing to order it if you make a request. Also, you can get it on Amazon.com and Christainbook.com. I'm sure it's also on some of the book swap sites. It's good to meet you. Well Your article is pretty good and I learn a lot from your blog. Thanks for sharing your views.